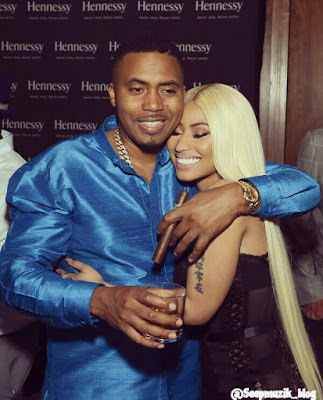 Home Enews Nas Nicki minaj Nicki Minaj and Nas Have Reportedly Been Dating Since May!! Nicki Minaj and Nas Have Reportedly Been Dating Since May!! not much more happened over the summer, but the two were spotted again recently celebrating Nas’ birthday at The Pool Lounge in New York City with quite a lot of PDA. And now, a source has told E! News that the two Queens rappers have been dating since May. "Nicki is not the type to date around," the source said. "They are still getting to know each other." Both Nicki and Nas posted photos with each other on their Instagrams after the birthday party, with captions that at the very least suggest the two enjoy the other's company. If this source has more or less confirmed that Nas and Nicki are dating, it would be mostly on par with what Nicki herself has been saying all year long. Nicki announced her breakup from Meek Mill in January of this year, and once the Nas dating rumors began swirling, Nicki was forced to address the rumors head-on when she appeared on Ellen in May. Nicki admitted that the she had "sleepovers" with Nas, but also insisted they had not done "the nasty." "I'm just chilling right now. I'm celibate. I wanted to go a year without dating any man. I hate men," Nicki added. If they are taking things slow, the stories seem like they could match up. However, in case that isn’t the story you want to hear, E! Newsalso got some contradicting news from yet another source. This other “insider” told E! News that Nas and Nicki Minaj are only close friends and have been for years. "Nicki and Nas are just very dear friends. Nothing romantic. They've been friends forever and have seen each other's careers take off," the source said. "Nas and John Seymour have recently just opened their second restaurant Sweet Chick in LA. The original Sweet Chick is in the LES [Lower East Side] in NYC. Nicki has been to both spots and always supportive of him and his new ventures," the source said, as if he or she knew exactly why people are speculating about the two rappers’s relationships. "They share a really close friendship and always has each other's back," the source continued. "Nicki is single now and dating but nothing serious. Nas is a best friend to her so as of now nothing is stirring up. People always joke around though that they make a great couple!" Well, there you have it, folks. Are Nas and Nicki just incredibly close friends or something more? Pick your own adventure!